count on to get your students quick wins. I'm not saying you abandon that multi-module, in-depth class that imparts your best systems and gets students to big wins. Rather I'm saying: start with first steps. In this way, you become familiar with the tools you need to produce and deliver a course. You give students a way to become familiar with you and your offerings in an affordable and easy way. What's more, you can validate your direction, since purchases and student experiences will give you immediate feedback on your teaching intention and content. So just what does a simple digital product look like? Here are six ideas for a first small offering that teaches, as well as an overview of the processes to create and deliver. These 6 offers are presented below in increasing complexity of creation and delivery. What's key to understand is that instead of using an online classroom platform, you'll deliver links to download files or view them online. Those “files” are going to be one or more of: pdf, audio, and video. You'll use an ecommerce tool that either stores the file right on their server for download OR that provides links to the content you've uploaded either to your server or a storage service. You'll make sure to connect your sales to your email service so that you can correspond with purchasers. Storage for pdf and audio files at Amazon S3. Storage for video files at Vimeo or Wistia. Your email service provider capable of “tagging” and sending out a sequence of emails. I recommend ActiveCampaign or ConvertKit. 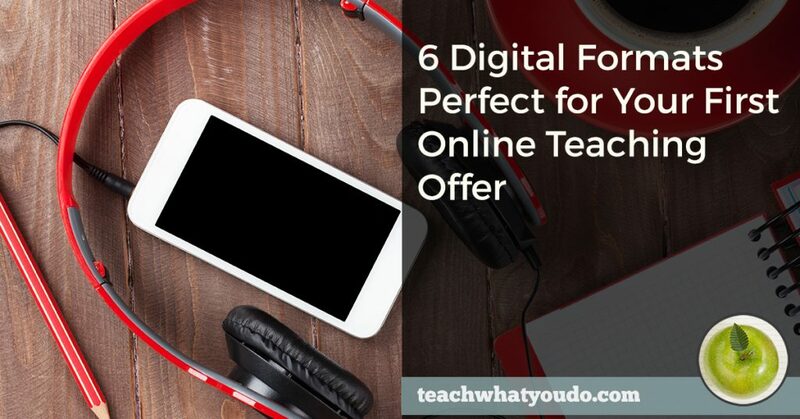 And now onto the details of 6 digital teaching products to get your teaching started. Choose a focused area of your bigger signature course that you can teach with the written word and appropriate illustrations. Choose illustrations for your eBook. Use your own demo photos for a creative or technical how-to. Use fewer, stock photos for other topics. Lay out your eBook. Hire someone via a service like Fiverr. Or if you have skills, use layout software like Publisher or InDesign. Sell with a digital commerce tool that enables you to sell and deliver files from your account there. With this tool, you’ll accept payment and send an email through their system with a link to your digital eBook. Tools: Gumroad, Sendowl. Connect your digital commerce sale to your email service so that email address and a tag for the purchase are added to your email service. If they don’t have built-in integration. Use Zapier. Consider basic tools, patterns, and templates that your students could use to get started with the work you’re teaching. You might include these as supplemental tools in your signature course–but introduce yourself and get people started right now with useful roadmaps. Make the templates, patterns, or tools. The end result is one or more digital files. It might be a pdf of recipes or patterns. It could be several application specific files, for example: Powerpoint, Photoshop, Publisher, or Spreadsheet. Create graphics that show off the results people can get with these tools for promotion. Compress and combine all files into one zipped file. Choose first content you could teach in about five steps. Each step is taught with the written word in an email AND would include an assignment. If you need more than one image or illustration per lesson, use the eBook format instead. Lesson and assignment completion should be paced tightly, at one to three days apart. Write the five lessons and five assignments. Choose no more than 1 image per lesson to be included within the email. If you’re includ woingrksheets to be downloaded by participants, figure out where you’re storing them and get access URLs. Set up a “tag” in your email service that will trigger delivery of the emails. Set up a “campaign” in your email service that has an email for each lesson. The “tag” you just set up should trigger this campaign’s delivery. Compose and “style” your emails. Choose font, colors, lesson flow for easy readability and for united look throughout the series. Set up “delay timers” in your campaign to deliver the emails, one after another, based upon the date your student purchased the course. Choose an ecommerce tool that will integrate with your email service either directly or through Zapier. The goal is to accept payment and add purchaser’s email address and a tag in your email service. Sendowl and Gumroad integrate both directly and with Zapier to many email services. Find three to five experts or people who provide a good case study (success story) on a focused aspect of your topic. Interview them with audio and/or video and record and sell those recordings. Choose a focused topic that’s well taught and illustrated by conversations with others--and around which you know people to approach. Decide how this work will benefit your contributors. They may want to do it for exposure. You could pay them outright. You could offer affiliate commissions for their promotion of the course. Collect headshots, bios, any relevant links. Outline each interview. Come up with a standard open and close. Choose and test your interview and recording platform. Start with Skype. Be sure to do a test conversation and recording so you understand process and see what the quality is like. Choose and test an editing tool. Once you’ve run a test recording, now open it with your editor. Make sure you’ve got a source file that you can edit to your satisfaction. Choose hosting for your audio and/or video files. An easy solution is to host audio files on Amazon S3 and video files on either Wistia or Vimeo. Produce audio and or video files. Place on hosting and get file URLs. Design an email in your email service to present the series/deliver the product. Link to the audio / video files in the email. Pre-sell your short and focused course. Then teach it in one or two live virtual (webinar) sessions. Choose your focused topic and develop an outline for your presentation. Decide how you will present; i.e., with you talking and demoing straight to camera or talking over graphics or slides or a combo. Develop slides and/or outline for presentation. Choose a platform for delivering your live presentation. Zoom and GoToWebinar are two popular and easy-to-use platforms. Practice your teaching using the platform. Make a practice recording. Do practice edits on the recording. Choose a platform for hosting your video recording. Wistia and Vimeo are top choices. Schedule and set up the live session on your webinar platform. Get the link you will share with students for attending the live event. Set up a “tag” in your email service that will trigger delivery of the emails both before and after the live session. Set up a “campaign” in your email service that has 1) an email that goes out immediately after purchase with details for attending the live session; 2) emails that go out at least twice before the live event to be sure your students know when and how to attend; 3) emails that go out afterward with links to the recordings. Host the session. Teach and record. Upload recording to your hosting and be sure it’s linked up in the follow-up emails that go out afterward. Choose a focused task that is done with a tool on the computer, and create one (or a few) screen capture videos that show exactly how to do this focused task. Choose your walkthrough tutorial. Stage work and projects and do a practice run through. Set up microphone for recording audio. If you also want webcam included, set that up. Use a screen capture tool (like Camtasia or ScreenFlow). Do a practice recording, editing and rendering of a short piece to make sure you have good quality of video and sound. Record the complete walkthrough. Edit and produce in video file. Choose video hosting. Wistia and Vimeo are good choices. Upload video to hosting. Design an email in your email service to present the video names linked to the video URL on your video hosting. Set tag up to trigger sending of email from your service with the video link. 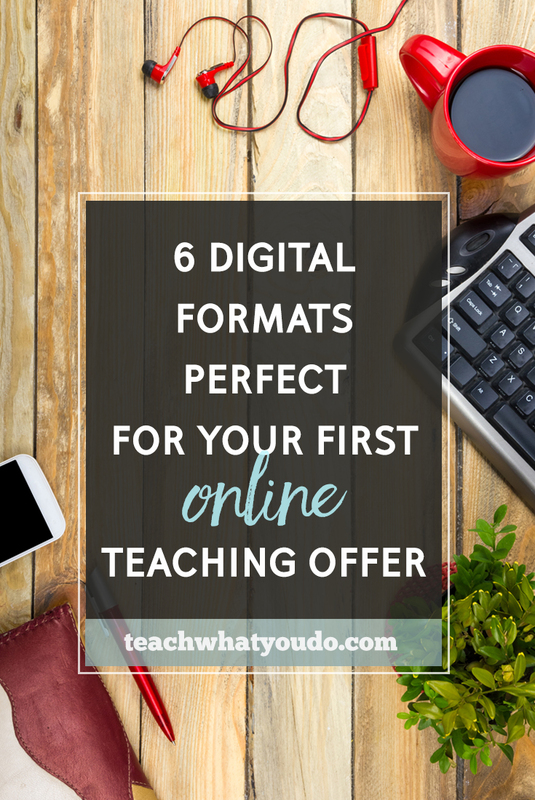 Which digital format will you start with? And do you have questions? I'd love to know which of these you're thinking of getting started with. And I'm available to answer your questions or concerns. Come on over to the Prep School for Online Course Builders Facebook Group to start a conversation.